In recent weeks I've been evaluating a stunning organic patchouli oil from Indonesia, assessing it for inclusion in a perfume I am planning to create. I am impressed with its earthy dampness and cool, crisp "white musk" vibe. When I smell this, I feel somehow transported back in time to my childhood... back to days where there were Very Hungry Caterpillars; where Owls and Pussycats sailed to distant shores in pea-green boats, and wild rumpuses began where the Wild Things were. I feel it only natural though, that this profoundly organic scent triggered my sense of recall and flung me back into the 70's... the use of patchouli was rife in perfumery at the time, and typified the entire era. 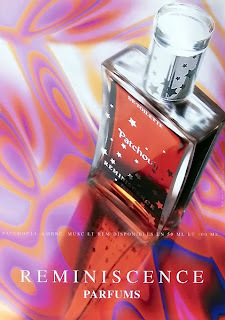 Hot on the tails of this evaluation, I hoped to find some new interpretations of patchouli used in perfumery, and so the opportunity arose - via a very kind friend - to sample a scent launched by French jewellery/perfume house Reminiscence. 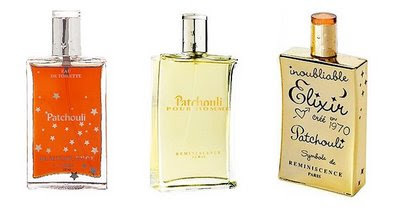 When doors opened to their Antibes store on the Côte d'Azur in 1970, founders Zoe Coste and Nino Amaddeo launched a trio of perfumes to complement their jewellery line - one of which was the aptly named Patchouli. Success followed, and the scent went on to become a triumph and the brand's flagship perfume. This eau de toilette is still in production to this day, and in 2000 the men's version Patchouli Pour Homme was added to their portfolio. However it was the enchanting gold flacon of the Inoubliable Patchouli Elixir EDP - a 2007 reinterpretation of the original scent for women - that attracted me to this line. I am now in possession of generous samples of all three scents, and have enjoyed wearing each of them. The ladies Patchouli EDT is a dark chocolate-coloured liquid - one that I might mention is likely to stain if applied carelessly to clothes - and the opening accords tend to follow suit... an initial burst of syrupy chocolate features and then fades as crisp woods emerge. There is distinct sandalwood and cedar here until the dark patchouli pushes through and dominates. It brings with it not only a thick, earthy quality that is to be somewhat expected; but also a transparent sense of "coolness". Rich amber ribbons of labdanum flutter through the scent as if caught on the wind, and a creamy tonka/vanilla streak sweetens the mix. But this is the scent of a damp dark forest - one that might feature in a Brothers Grimm fairytale. For an eau de toilette, Patchouli delivers many hours of rich, enjoyable persistence. The bewitching gold flacon of Patchouli Elixir EDP is indeed a thing to be desired; so too are it's contents, sold the promise of a richer woody-oriental take on the original women's release. But to my nose, the contrast between the two is minimal. Elixir, whilst a paler amber-coloured juice, opens with pretty much the same accords - perhaps a little lighter on the chocolate though. Here, amongst the expected woods, resins and signature patchouli, one might occasionally glimpse a flash of dark vetiver green, but the similarities between the two may be too close to call. Perhaps a distinction can be made in the way Elixir appears to lack the same sweetness of its predecessor; at least in part, anyway. To my nose, the dry-downs are identical, and the longevity/sillage pretty much on par with one another. Despite the beguiling packaging solution, to be frank, I can't really imagine the reason for Elixir's release. Both scents are wonderful, but not individual enough to warrant owning both. Patchouli Pour Homme, however is a whole other story. With a sharp citrus opening of mandarin and lime that have been imbued with French lavender, the top notes are similar in style to many men's colognes of yesteryear. Alongside the other two releases, initially this scent almost seems a little displaced. However 10 minutes in, the patchouli is more distinguishable and one can draw light parallels amongst the three. The approach to Patchouli Pour Homme appears to have been to garner mass appeal... the woody accords of Virginia cedar recede and sparkling geranium moves forward. Here, the patchouli almost seems to take a subordinate role behind all the other accords. There is nothing dark or brooding about this scent - it is a fresh woody fragrance that I'm not actually convinced hits the mark. What I do enjoy, however, is the nice resinous turn upon the dry-down in which benzoin, labdanum and shimmering white musks bring a dying puff of opulence - though perhaps a day late and a nickel shy. Whilst I may bemoan missing out on the wonderful Elixir flacon (for weeks, possibly), I would personally invest in the women's EDT version and enjoy the savings it has to offer - it is dirty and manly enough to pull off by the gents, and opulent and gourmand enough to please the ladies. Though none of them quite capture the essence of true organic patchouli oil, I feel on the whole they have much to offer the patch enthusiast. Thanks for the reviews . I can hear the bells on my skirt hems! I still use pure oil on ankles as it reminds me of an asian friend at school who'd bring in fabrics for sewing class that wafted patchouli around and I fell in love with it. Ankles, you say? I've never considered this... do you find it effective? Hi D, I have the ORIGINAL 1970s-1980s Patchouli, it is soooo heavy and long lasting. I may have to send you a decant.